If you visited my home right now you would notice how desperately my windows need cleaning. Particularly the window of my front storm door and sliding door to our backyard. But, I won’t clean them. On these windows, likely from miles away, one could see tiny handprints. Tiny smears and smudges from Summer’s sticky hands. Nose prints from Baylor’s cold, wet nose. And knee prints from me continually propping open the door to let them outside. As gross as it may seem to most people, it tells a story. Summer is a daddy’s girl through and through. Every day, she wakes up and insists on seeing him. Yesterday, when I went in to get her after nap, she promptly asked me to leave declaring that she wanted her dada. Earlier today, she came to tell me she had a messy diaper and insisted her dada come home from work to change it. Her adoration of him is striking, lovely, beautiful, and heartwarming. 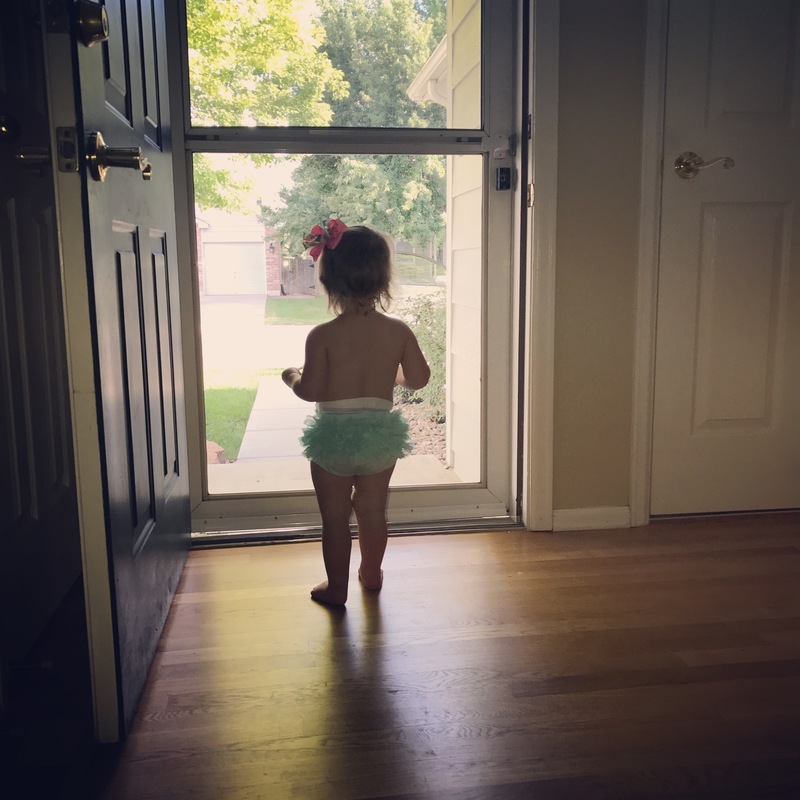 When she hears that her daddy is coming home, it is not uncommon for her to run upstairs to get her bow, jewelry, and favorite tutu. She will ask me to dress her up for his arrival. She will then stand by front door with her hands pressed against the cold glass of the storm door and await his homecoming. It is a precious sight. One I never want to forget. So much of this dynamic is a mirroring of how our relationship with God can and should be. I love her anticipation of his coming home and of the fun they will have together. I love how she expects the best from his presence. She expects him to pull into that driveway with pure delight in her plastered all over his handsome face. She expects him to tell her how pretty she is and for him to marvel at that day’s rock or bug collection. I love that she can, and does, expect all of this this. The glass sliding doors to the backyard reflect the same sort of anticipation. To her, the backyard holds endless adventures of gardening, bug and rock collecting, fetch with Baylor, bubbles, and beyond. As soon as she is excused from the table, she toddles up to the door begging to go outside. She will press her messy hands and face up against the glass until I come and open the door for her. She then squeals and jolts into the backyard with abandon. With a pure expectation of adventure and fun. I am loving the messy glass and the story it tells these days. I want my relationship with Father God to mirror this same sweet love. I want my heart to beam with the same anticipation of God’s goodness. Of my expectation of His presence, His pleasure in me, and the fun adventures He has for me every day. I want people to peer through the windows of my life and see evidence of anticipation of God’s presence and adventures the same way people see handprints of anticipation all over my front door. Sometimes it can be difficult for us to believe that God’s pleasure in us follows the same pattern as Ryan’s adoration of Summer. It can be challenging to see how we could expect Him to have good for us or for Him to delight in us when our life feels so messy. But, the Truth is, He loves us with abandon. Nothing we can or will ever do will separate us from this powerful love. We can expect good. We can expect to be delighted in. And we can expect life to be a beautiful adventure as we walk hand in hand with Him.